One really great thing about the internet in general, and social media in particular, is the ability to find and interact with people you once idolized, and only read about in magazines. Such is very much the case for the old-guy-skateboarder, like me. As you can probably tell from my previous posts, I’ve really been going back and thinking a lot about pre-1980s freestyle skateboarding. 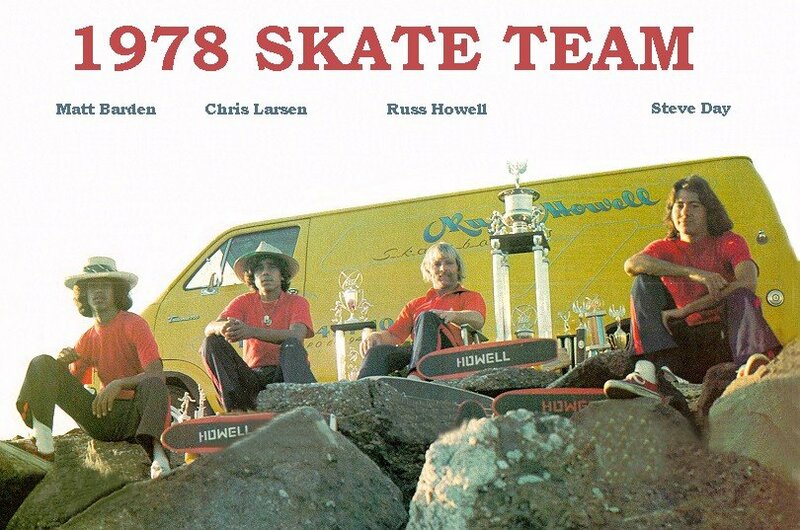 When I started skating in 1975, some of the top freestyle skaters were Russ Howell, Ed Nadalin, and Chris Chaput. 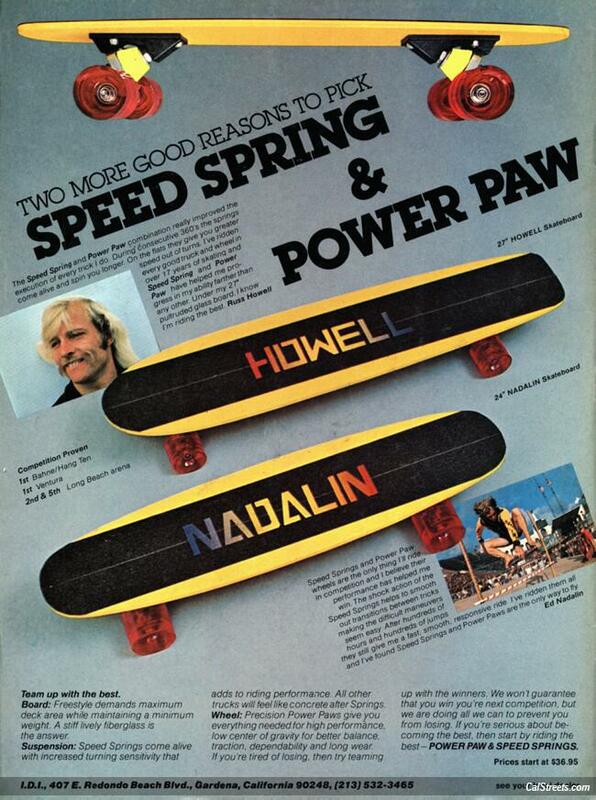 Russ and Ed, at the time rode for a company called Innovative Designs, who manufactured and marketed Power Paw wheels, Speed Spring trucks, and various boards including Russ and Ed’s signature freestyle models, small fiberglass decks. All three, Russ, Ed, and Chris, were featured in the skateboarding magazines of that time. I remember them mostly from Wild World of Skateboarding and Skateboard World. At the time I think Skateboarder Magazine must have been covering the Dogtown scene mostly. Russ and Ed’s pro models were remarkably inexpensive. Not sure how that happened, but at the time you could get their boards for about $30-$40. I got my Nadalin model at KMart, which also carried the Howell at one time. Now, keep in mind this was in like 1976-1977. Check out the trucks. Yep – the same configuration as a Randal-style truck has today. I’m not sure if these were the first such trucks on the market or the Gullwing Split-Axle. The Power Paw wheels on these boards came with good precision bearings. The real thing. And while the flexible lip of the wheels didn’t help them in the speed area, they were good, solid, smooth rolling wheels. These boards were pretty tiny by today’s standards — about 6 inches wide, but they worked really well. I think it is noteworthy also that the Nadalin board is symmetrical/bi-directional. Pretty advanced. I have written at length about Ed Nadalin on a previous blog, and Russ is pretty well documented these days, as he is still active. I would, however, like to talk a little about the Russ Howell team and the years between 1977 and 1980. At some point around 1978 Russ formed a team of freestyle skaters, pictured below. I was always fascinated by these guys. This was waaaaay before video became even remotely available to consumers, so unless you were lucky enough to see someone skate in-person all you could hope for was magazine shots. I loved the idea that there was a skate team focused on flatland freestyle. Now, 1978 was the year right before freestyle started getting extremely technical. In the coming months, a young Steve Rocco would get his “Who’s Hot” article in Skateboarder magazine, rail tricks would be explored, and freestyle would…errrrr…change. I get the feeling that these guys were right in the middle of those periods. 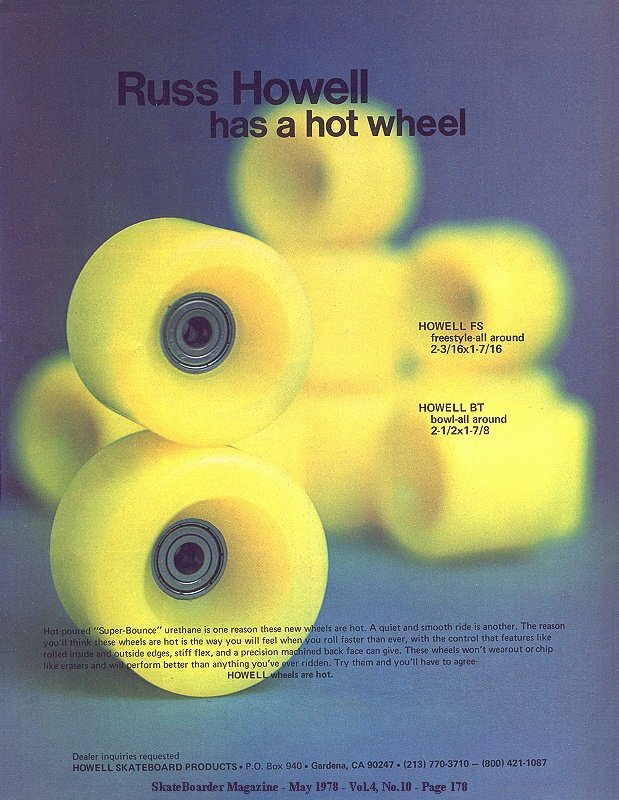 As you can see, they are all riding the same Russ Howell model made by Innovative Designs, Inc., but at this point Russ had a better wheel available, as shown here. The small one, the freestyle wheel, was about 54.5 mm in diamater, which puts it on the larger size of a modern street wheel, but pretty small for that time. Ahead of it’s time. They had upgraded the urethane from the old Power Paw formula too. I always wanted a set of these wheels, but they were not easy to come by. I’m sure that Howell’s company was essentially an agreement/marketing plan between him and IDI, but I don’t know that for sure. I do know that by this time Nadalin had pretty much disappeared from the scene. I am stoked and honored to be in contact with Ed on Facebook — so rad! 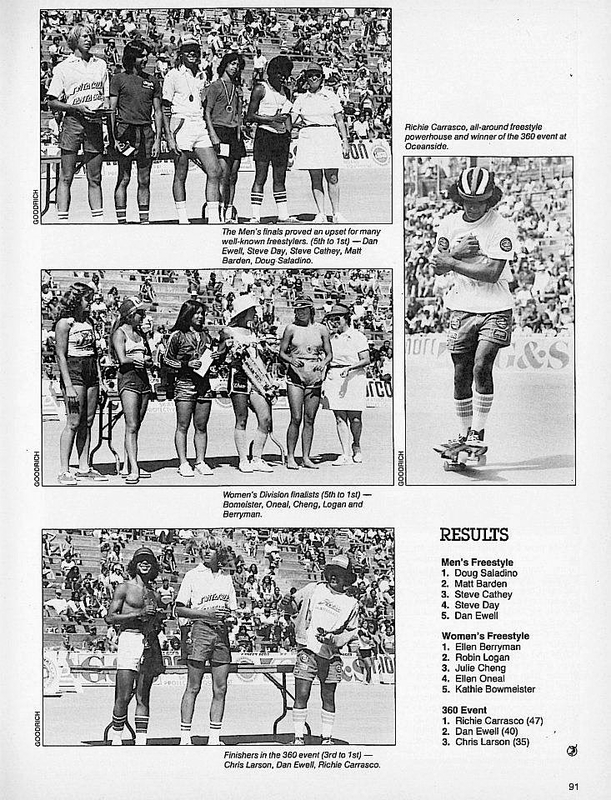 In 1978, the big freestyle event was the contest at Oceanside. That spot has hosted many great FS contests over the years. All-terrain ripper Doug “Pineapple” Saladino, riding for G&S, won the event. Two of Howell’s skaters, Matt Barden and Steve Day, also placed. Their teammate, Chris Larsen, got 3rd in 360 spinning. So yeah, that was a pretty impressive team. On episode #1 of the Freestyle Podcast, Matt Gokey quoted (or paraphrased) Russ Howell as saying “Its’ not about who you can blow over with your skating, it’s who you can lift up.” You can tell from this team that Russ lived by that quote even then. In recent years, Russ has said a few things that question some sacred cows of skateboarding, such as the real value of the Dogtown/Z-Boys guys and what they brought to skating. Well, everyone has their opinion on this kind of thing. However, I think if you look at the historical record — what he did — like bringing these guys together — Russ’s contribution to skateboarding is pretty clear. He’s about bringing others, as well as skateboarding in general, up.